Ouvéa is a commune in the Loyalty Islands Province of New Caledonia, an overseas territory of France in the Pacific Ocean. 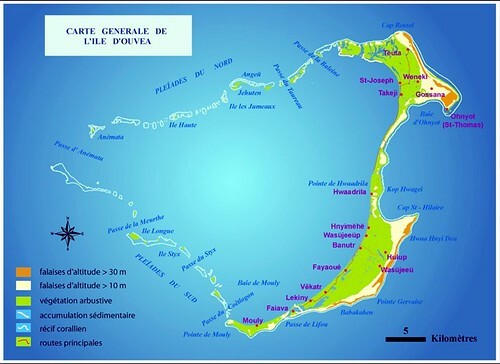 Ouvéa is made up of Ouvéa Island, the smaller Mouli Island and Faiava Island, and several islets around these three islands. All these lie among the Loyalty Islands, to the northeast of New Caledonia's mainland. Known as ‘the closest island to paradise', Ouvea is hailed as New Caledonia's finest beach and is one of the Pacific's most exquisite coral atolls. Home to a stunning 25km beach of pristine white sand fronting a turquoise lagoon, the island has a single road and is less than 40 meters wide at some points. Mild weather, friendly people of Melanesian and Polynesian descent, plus stunning seascapes all help to make Ouvea an earthly paradise.